“Whilst tidying up my APC CPD for submissions in a month, I read the new CPD FAQ’s V1.0 November 2012 which mentions that the following cannot be counted towards CPD: “Any activity that does not have a clear learning purpose, or does not relate to your role and/or specialism cannot be considered as appropriate CPD. Activities such as networking, social events, team meetings or informal planning events and involvement on boards, committees or clubs that have little or no relevance to your professional role, cannot count towards your CPD requirements”. I am sure in a previous version of RICS APC ‘Your practical guide to success’ book it said you can attach some sports clubs/teams/social work you do as long as it is relevant. Can someone please clear up this fine line”. Grad 1 & 2 – You do Professional Development, 48 hours minimum per year, and should be focussing this on your declared competencies and ONLY writing it up in your Template 4 for the APC Graduate Candidate Final Assessment Documentation. Do not write it up in the RICS web site CPD Online system. Review the RICS APC Candidate Guide. Grad 3, Adapt 1 – You do CPD in line with the Chartered Surveyors quota and principles (min 20 hours in last 12 months). But write it up in Template 4 for the APC Graduate Candidate Final Assessment Documentation. Do not write it up in the RICS web site CPD Online system. Review the RICS regulation help sheet on CPD. PER – You do CPD in line with the Chartered Surveyors quota and principles (min 20 hours in last 12 months (New System)). 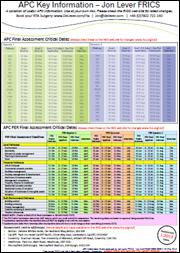 But write it up in the PER template provided for the APC PER Candidate Final Assessment Documentation. Do not write it up in the RICS web site CPD Online system. Review the RICS regulation help sheet on CPD. SPR – You do CPD in line with the Chartered Surveyors quota and principles (min 20 hours in last 12 months). But write it up in the SPR template provided for the APC SPR Candidate Final Assessment Documentation. Do not write it up in the RICS web site CPD Online system. Review the RICS regulation help sheet on CPD. As for what you should be recording, I would suggest you focus your PD/CPD on a range of learning styles on subjects that will compliment your declared competencies. Do you need some Final Assessment encouragement? 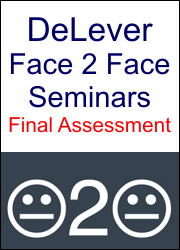 Well, next Monday (4th March 2013) Jon Lever is delivering two final assessment focused APC seminars in London at London South Bank University. Accredited Degree, leading to APC. Who? What? When? “I have already completed a degree in Business Computing BSc Hons. Now I would like to become a building surveyor. I am fully aware there are many pathways in and I also know I need to complete a Masters degree now to become accredited. Just looking for some information on how I go about the APC and when do I need to start this? I hope to start the ‘Masters’ in September 2013. I look forward to hearing from you all”. Hi there, you have a number of options, most of which relate to relevant surveying experience. 1. Accredited degree or a first degree in anything but topping it up with an accredited masters. If you have little or no surveying experience you will likely do Graduate Route 1 (minimum 2 years training) which you can start at the same time as your Masters and run the two in parallel. Just check with your Masters provider and also the enrolment team at RICS. NOTE: the Masters and APC minimum 2 year period coincide at the final assessment and dissertation so my advice is to finish the Masters and do the APC final assessment 6 months later. If you have some surveying experience you will still be limited by education and the future the achievement of the Masters so I would still advise you to go with Graduate Route 1 in this instance. Also the Masters does have a diploma level I believe (excuse me if I have the terminology wrong) but basically the Masters without the dissertation. RICS will accept the diploma level as access to enrolment too, but again check with the Masters provider and RICS enrolment team. If you have a first degree and it does not really matter what in AND 5 YEARS POST DEGREE experience in the type of surveying you wish to do you can enrol on the PER. This is a relatively new route but may provide you with an opportunity. Just make sure though it is relevant experience and I would remind you this IS NOT an easier option as you still have to sit the APC Final Assessment and it is very important to provide the correct submission papers just like the Graduate Route candidates have to. Also you can find key dates for enrolment on the RICS web site or at www.apccentre.com on the home page download my useful APC Info sheet. It’s time for a POLL! 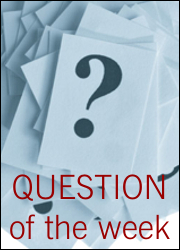 So here is our question… We await your response with interest. I have collated a range of APC information into a handy Info Sheet that I use in my travels as an RICS Training Advisor and with my other DeLever seminars and Masterclasses. 3. Reiterated importance of checking back with the RICS web site for latest changes as users of this document are not registering in the disclaimer that this is MY document not the RICS’s!!! On occasion RICS update things that take a while to filter through. So, it is better to email me back (um, email address is on the top of the document!) and let me know MY document is different (maybe out of date) rather than asking the RICS why theirs is not correct! RICS web site ALWAYS takes precidence over ANY other document or web site so if it does NOT MATCH, the RICS are ALWAYS right. Simple. (Rant over). I hope you find it of use. Note: This document is updated periodically so check back from time to time to make sure you have the latest version. I will post updates here so why not follow this blog so you can get the latest updates? Disclaimer: This document is produced soley by DeLever Limited (Jon Lever FRICS) and is their interpretation of the RICS APC Guides and online information. Any, content or suggestions are soley the interpretation of DeLever Limited (Jon Lever FRICS) and are not endorsed by any other party. 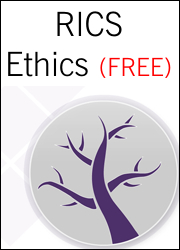 Candidates use this resource at their own risk and DeLever (Jon Lever FRICS) takes no responsibility for any errors or omissions that have been made in its production. It has been a bit of a niggle for many years that a fair number of APC candidates I have assessed know little or nothing about the depth of Construction Technology. 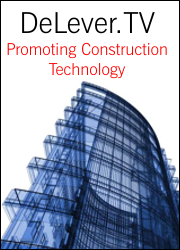 An idea came to me that through the use of todays technology (YouTube) I could at least make an attempt to offer APC candidates the opportunity to develop and grow their knowledge of Construction Technology. So, I am on a mission to find the ‘good’ links and videos that will assist and inform. Why not pop along to www.DeLever.tv and take a look at the videos I have already found for your interest. I think, so far, I have only scratched the surface! I hope you find this resource of use.